A native of Blacksburg Virginia and a graduate of Virginia Tech, Matt McMurray is the President and Founder of Campus Automotive Inc. He has more than nine years of experience in the auto repair and towing industry, and is a third generation shop owner. Matt’s father, Steve, owned Campus Exxon for more than 30 years. After college Matt spent eight years as manager and eventually Vice President of Campus Exxon. He is a graduate of the Automotive Training Institute’s Shop Re-engineering program and is an Accredited Automotive Manager (AAM) from the Automotive Management Institute. In addition, Matt is a level 4/5 Wreckmaster. 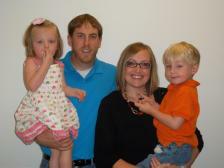 Matt is married to Jessica, and has two children, Sean and Taylor. Johnnie has been with Campus Automotive, INC. for over three years and currently serves as the General Manager. He has a bachelor’s degree from Bluefield College in organizational management and development. His learning hasn’t stopped there as Johnnie attends numerous training opportunities relating to customer service, leadership, and quality hiring practices all provided through the Automotive Training Institute. Mr. Self is Wreckmaster 4/5 certified in accident recovery. Johnnie’s keys to success are efficiency, integrity, hard work, and personal accountability.